Premier Coconut Oil is easily digested with a luscious, full coconut flavor and aroma. It is an example of first-class nutrition that is an ideal oil for baby foods and is an impressive source of beneficial fatty acids, such as medium chain fatty acids. 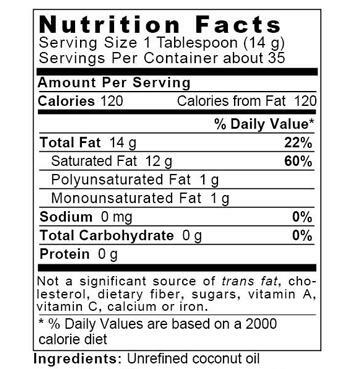 Premier Coconut Oil is naturally free of trans fats. In Kerala, India, our coconut oil is placed in nontoxic HDPE drums, then nitrogen-flushed (to prevent oxidation) for its trip to the U.S. When it reaches our U.S. facility, we repackage the oil in custom-made, light-blocking, nontoxic PET plastic. Adults: take 1 tablespoon daily mixed in smoothies, salad dressings, grain dishes, sauces, desserts, snacks, etc. Infants and children (age 10 and under): take 2 teaspoons daily mixed in food. Once this container is opened and refrigerated, use within 90 days. Please refrigerate after opening.